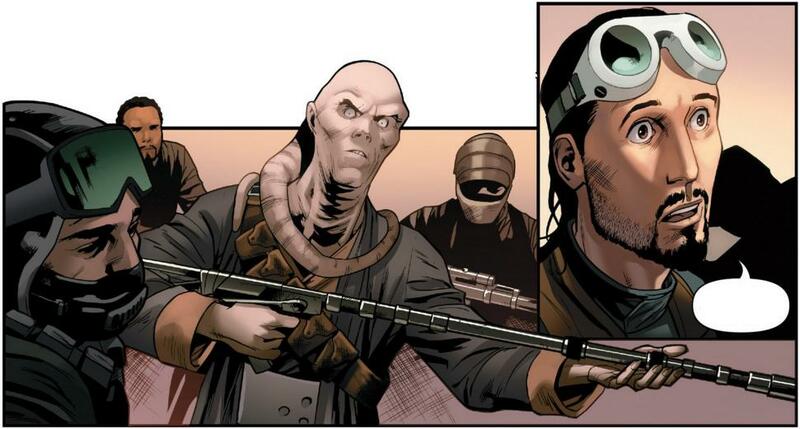 Rogue One #1 kicks off Marvel’s comic adaptation of the first Star Wars story standalone film. Unlike last year’s attempt at adapting The Force Awakens into a comic, Rogue One #1 makes some great strides at delivering something different. While still managing to tell the story of the movie, the comic adds extra scenes and imagery that expands the story. Though they are subtle changes, it does create a different feel to the story that makes the adventure feel worthwhile. Most telling of all, however, is the final page of the comic which includes a message from the film’s director, Gareth Edwards. I have a confession – I must have watched the opening crawl to A New Hope over a hundred times as a child, and never once pictured the events it describes. I guess my overexcited childlike mind just wanted those ‘boring’ yellow letters to hurry up and float past so we could get to the real fun and excitement, like a giant star destroyer flying overhead! Which is strange, as one of Star Wars‘ biggest strengths is that it makes your mind constantly race with possibilities. As a child I truly believed these characters were real. I wanted to go into space, find them, live there! But sadly, it was in a galaxy just too far away…but then, in the summer of 2014 I got the next best thing. I moved to San Francisco and started working at Lucasfilm. And like the heroes in the film, we did make sacrifices. We cut things out, we rearranged, tightened; and merged ideas together…if only there was a place where some of these forgotten scenes could actually live an exist again. 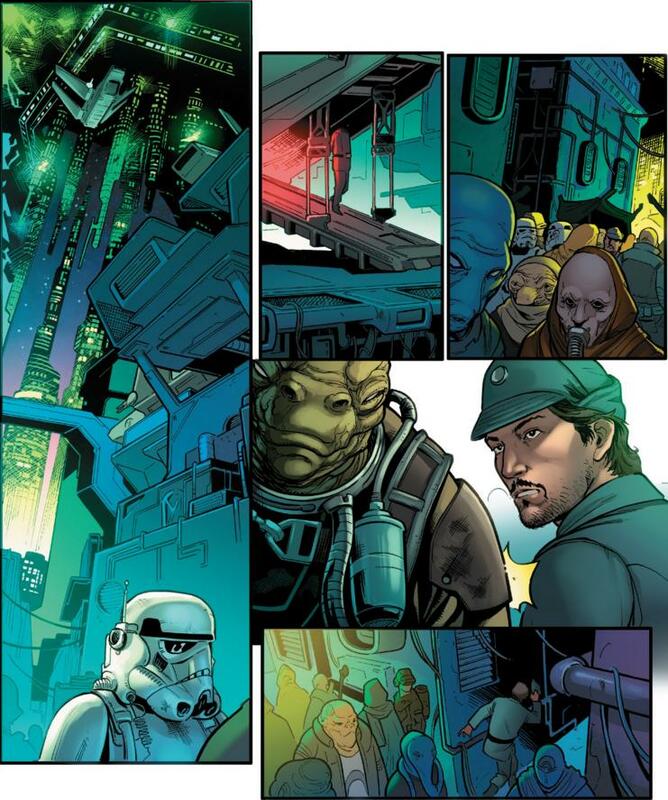 Thus Gareth Edwards sets the stage for what this comic is setting out to do. All those deleted scenes fans are begging for are being given an opportunity to exist via this comic. It allows those small, miniscule moments to fit into the larger narrative so they make sense. There’s a scene between Galen and Bodhi where he convinces the Imperial cargo pilot to help him. There’s a scene of Jyn in her prison cell talking with her tentacled inmate which features dialog from the novelization. There are scenes showing Bodhi’s arrival and defection on Jedha as he initially meets Saw’s troops. There’s an extended intro for Cassian on the Ring of Kafrene and a parting shot actually makes some sense of why he killed the informant (as having dead Stormtroopers and a dead rebel makes for a tidy report and no loose ends). There’s additional shots on Wobani, a shot of how Jyn got her pistol at the rebel base, some additional dialog between Tarkin and Krennic, and an extra scene of Maze and Chirrut. Plus there’s some flashbacks interwoven into Jyn’s interrogation which adds additional weight to the scene. One of the flashbacks actually shows when Saw left her as a child with a blaster in her hands as she later describes in the movie. All of the extra scenes and dialog are minor when taken on their own, but together, woven into the scenes of the film, it creates alternate narrative. One could argue a richer narrative, but regardless, it gives the comic a lot of extra value. There are bits that add to the story, the characters and the scenes. Some of them help make sense out of other things, while some just help connect things better. The end result is that the comic not only offers readers something new, but it changes the way you see the film. This is more or less the alternate cut of the film that we will never see. 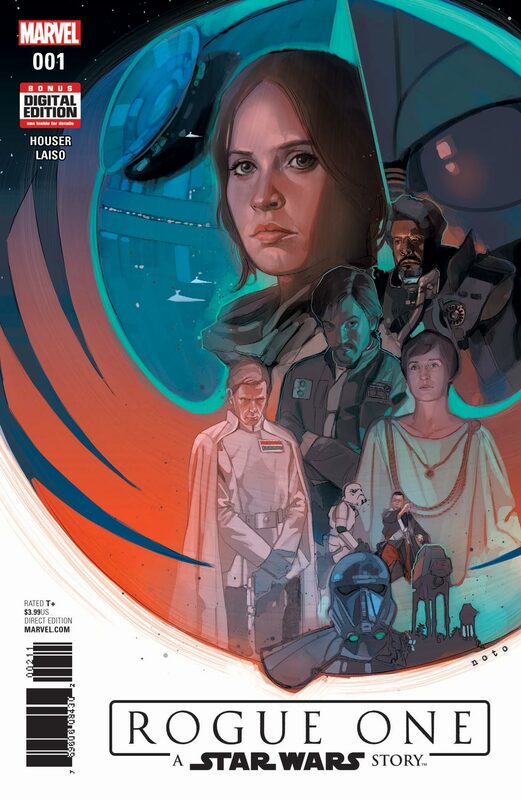 As for the story itself, this issue balances nicely between retelling the story of Rogue One and offering a different take through the use of extra scenes and dialog. There’s a good flow between the visuals and the dialog. The writing is good, and for the most part, the visuals are really nice. My one gripe would be that Krennic looks very different. 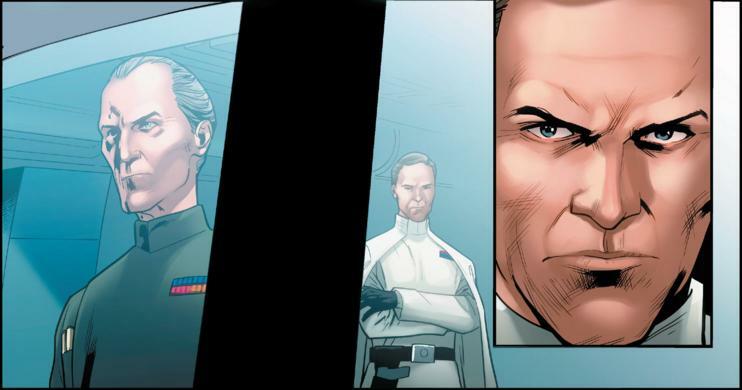 There’s not much effort given to make the depiction look like the Krennic from the film. Most of the other characters have a good likeness to their film counterparts. There’s some leeway, but overall it’s pretty good. By taking the task of adapting the film into a comic and managing to deliver a completely new experience for readers, I give Rogue One #1 a five out of five metal bikinis. This one is worth checking out.